After Texas Tech's lackluster win last night, they have fallen to 6th in the DPPI and Kansas rising to 5th. Iowa St. remains in 9th. 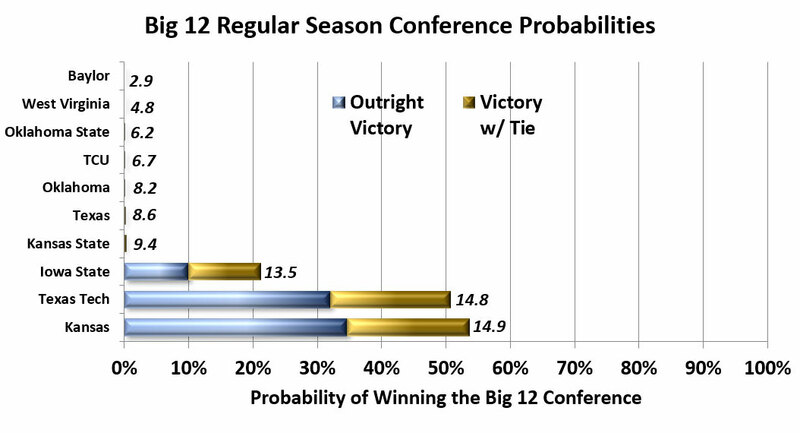 The early projections show Kansas with a 34.7% probability of winning the Big 12 outright and a 53.6% probability of winning with at least a ties. KU is projected to win 14.9 games. West Virginia is currently projected in 9th place winning 4.8 games. What is perhaps more shocking is West Virginia has the worst defensive efficiency rating in the Big 12 and by a good margin. Wowza. That's not very "Huggins-esque". Also surprised that the pre-season praise that KSU got hasn't panned out in the stats. KSU @.500 in conference seems low. Is there an upside for them? Socal, these are based on DPPI which has a single standard deviation of +/- just under 2 games. Kansas St. has a good defense but their offense has been significantly below expectations. This projection is still a bit early. The official preseason projection will come after all non-con games are complete. It appears to me that K-State was either over-hyped or they are in an offensive funk and will come out of it eventually.